Countdown for best gardens of the year! The snow is finally melting here on the South Coast of England, but we're watching all the rest of the world covered in white, particularly the East Coast of the US! It certainly looks like some of us are going to get a white Christmas. Just wanted to let my readers know that I'm about to compile my list of best gardens visited this year, so if any of you have any suggestions, do leave me a comment ... I shall be posting them as the 12 days of Christmas, so please let me know if there's a special garden close to your heart. I'm also looking for suggestions on gardens to visit to 2010 .... so let me know. This will be very difficult but I shall look through your archives and try! Happy Winter Solstice Charlotte! How fun this shall be! I have so enjoyed them all since discovering your blog. 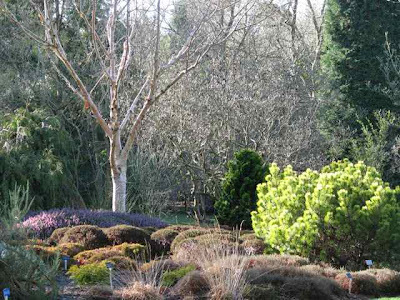 Personal favourites: Rousham and the Beth Chatto Gardens. For next year..... gardens of Ireland perhaps? My find of the year was Corpusty Mill Garden (http://www.corpustymillgarden.co.uk/). If you haven't visited I'd suggest putting it somewhere near the top of your list for 2010. Happy Christmas. Charlotte, your posts are all so beautiful that I'll be pleased to see any of them. ;) We visited England and the gardens many years ago and cannot remember any that we did not love. Special in my heart was Stourhead; it is the scale of things that is so remarkable to me. In fact as soon as we returned, the first thing we did was plant a beech. lol I can dream about it. I have loved all of your gardens and look forward to seeing your top 12. Have you visited Huntington Library and Gardens in Pasadena, California? We also have a much celebrated garden in Arizona called the Desert Botanical Garden. Both are worth a visit if you get a chance. What a task you have at hand! I can't imagine trying to select the best of from the gardens you have visited. They were all so amazing. Each one was like a fairy tale getaway. If you don't mind I think I will simply stay out of the way and let you work your magic. The Veiled Lady at Borde Hill, to pair off with your chicken mesh nun. That is an image that is embedded deep in my memory. I do love that. the mesh gives her an otherworldly quality. For me it would be the Gardens at Hampton Court. I seen them 20 years ago and I am so impressed by it all. I still remember it all even now. Wish you a wonderful Christmas and a great year ahead! I look forward to seeing your list. Wisley, Great Dixter and Trebah are my favourites. I see I'll have to begin going back through your archives to view these beautiful gardens everyone is mentioning. How exciting for you being able to travel and see so many glorious gardens! Yes, the east coast of the US was socked with that big snowstorm, but here in upstate NY we were spared. We had just a little light snow Monday morning but we have a lovely snow covering from previous snowfalls. We'll have a white Christmas for sure! Wishing you Merry Christmas and a New Year filled with blessings. I look forward to seeing them too! I can recommend heading over to Ireland too. There are some really nice ones in N Ireland like Mount Stewart House and Rowallane Garden. I look forward to seeing your top favourites - I hope Great Dixter is amongst them! All I can do is wish you good luck while compiling the list. Your photos make all of the gardens look spectacular! We're enjoying rain here in Washington this year instead of the 6 feet of snow (2 meters) that we had last winter.